Swedish pancakes or pannkakor are a classic Scandinavian dish. Traditionally, they're served in schools on Thursdays after pea soup, kind of like our pizza Fridays. That's right, pancakes and jam at lunch! These pancakes are similar to other thin pancakes that you're already familiar with—namely, French crepes. Both are light and delicate, made rich by eggs, but have a slightly different appearance due to the addition of seltzer in the pannkakor batter. This creates a sort of bubbly surface and a brown lace-like pattern. 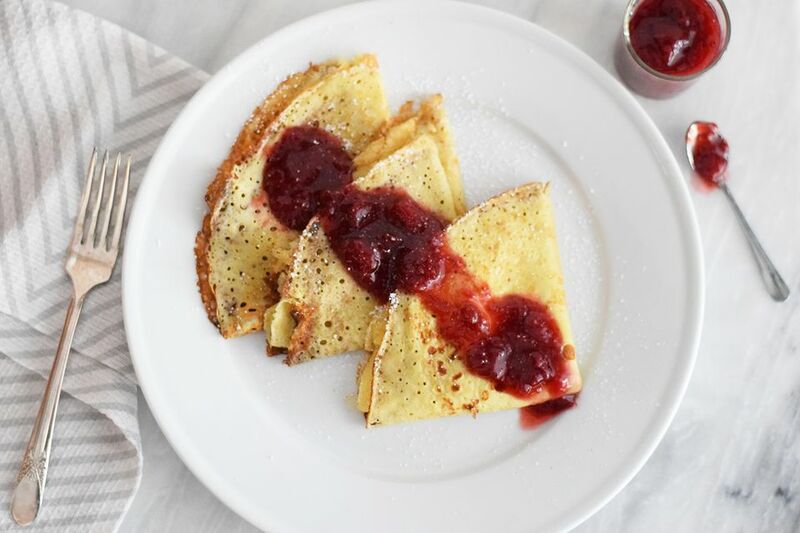 Traditionally, Swedish pancakes don't include the vanilla and sugar, but it makes them a little sweet and tastes perfect with dollops of strawberry jam! In a blender, combine the flour, salt, milk, eggs, sugar, and vanilla extract. Combine on high speed until completely incorporated and a thin batter has formed. Let the pancake batter sit and rest at room temperature for 30 minutes. Whisk in the seltzer and heat up your cast iron or non-stick pan to medium-high heat. Add a little bit of the butter to the pan and spread it around with a silicone or pastry brush to completely coat the pan. Turn the heat down to medium heat. Add enough batter to coat the bottom of the pan completely and swirl it around to completely coat. The pancakes are very thin so don't pour in too much batter or it will make the pancakes thicker in texture. Cook for about one minute and then carefully flip with a soft spatula. You can also flip using the pan and a quick handle movement. Cook for another 20 seconds on the second side. Remove from the pan and stack on a plate. You can stack the pancakes on top of each other as they cook. Add a little more butter to the pan before cooking each pancake. Add the strawberry jam to a pan and whisk in the water. Heat the jam until it's hot and slightly thinned. Fold the pancakes into triangles and top with the jam and whipped cream. You can also sprinkle powdered sugar on them if you wish. You need a good non-stick pan and a generous amount of butter to help make the flips successful. It's easiest to do a flip in the pan rather than trying to flip with a spatula since the latter can cause the pancake to tear. You can make these pancakes savory by omitting the sugar and vanilla. You can easily freeze the pancakes in a stack in a freezer ziplock bag. Allow them to thaw in the refrigerator and heat them up in a pan or microwave when you are ready to eat.